Manny Hickman was one of the most heavily recruited football players in Matoaca High School history, racking up over 37 FBS and FCS offers. The senior originally committed to Cincinnati, decommitted, got more offers and eventually decided on East Carolina, where he’ll play with teammate Jonathan Coleman and Thomas Dale High School’s Rick D’Abreu. At 6-2, 245, Hickman was a force at defensive end. He accumulated 50 tackles (13 for a loss of yardage) and six sacks, recovered four fumbles, forced a fumble, broke up a pass and scored a defensive touchdown. Jonathan Coleman II, or “Deuce” as he’s called by friends and teammates, will join Hickman at East Carolina. The senior served as a Swiss army knife of sorts for Parker, played defensive back and running back, and even handled punting duties. Coleman chose ECU over Alabama State, and Division II offers from Virginia State, Virginia Union and Concord. He rushed for 448 yards and six touchdowns, and caught five passes for 30 yards. Defensively, he had 29 tackles (three for a loss of yardage), two forced fumbles, a fumble recovery and two pass break-ups. Xavier Addison (5-10, 185) played for both L.C. 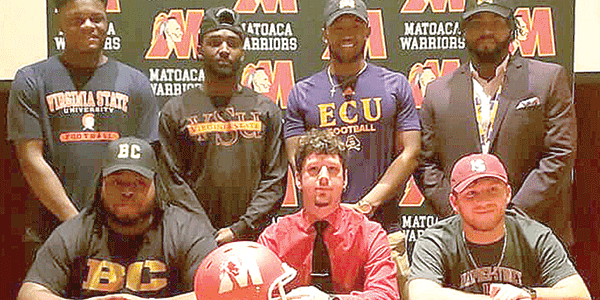 Bird and Matoaca during his time in high school, but finished his career as a Warrior with a flourish by signing to play locally at Virginia State with teammate Justin Providence. A two-way player, Addison got time at running back, but really excelled at defensive back, where he had 23 tackles (four for a loss of yardage), broke up 11 passes and nabbed an interception. Addison had offers on the table from North Carolina A&T and UVA-Wise, among others. Offensively, he helped Matoaca by rushing for 178 yards. A big (6-3, 230) blocker, Justin Providence made his presence known to colleges by doing the dirty work: opening up holes for his skill players. He hauled in a touchdown pass vs. Thomas Dale this season, and was a big part of the Matoaca offense. He also was the team’s long snapper, and figures to have a chance to do the same at Virginia State. In limited time on defense, Providence tallied nine tackles and a sack, forced two fumbles and recovered a fumble. Gage Luck, a smaller but agile 5-11, 220-pound offensive lineman, will play for Hampden-Sydney College. Gage was a key pull blocker at offensive guard, and used his knowledge of the game to make up for any size disadvantage he may have had. “[Gage] is undersized, but he’s a tough and intelligent offensive lineman [who] gave the program everything he had,” Parker said. When coaches dream of big, bookend tackles, they might look like DeMont Wynne. 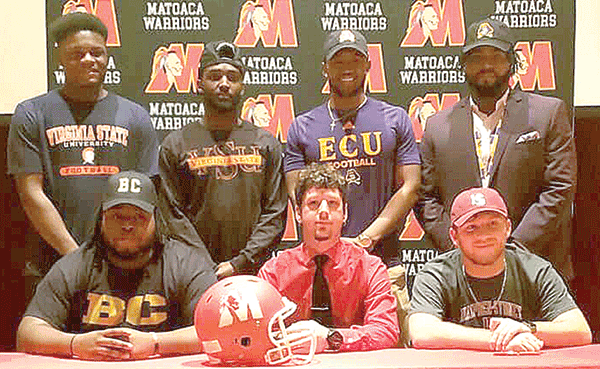 At 6-1, 320 pounds, DeMont Wynne played his role in Matoaca’s rich history of developing offensive lineman when he signed to attend and play at Butte College in Oroville, Calif. At the community college, Butte will provide Wynne with a chance to sharpen his skills on the gridiron and in the classroom. Many locals have excelled after taking time at a junior college. One lineman who stands out as doing so is Meadowbrook High alum Morgan Moses, who prepped at Fork Union Military Academy before attending Virginia and now plays for the Washington Redskins.